Can you create HDR images in Lightroom? Yes! Well, sort of. Lightroom only works with one photograph at a time, so you can’t blend different exposures of a scene together. But you can handle some high-contrast scenes in Lightroom, without HDR software or Photoshop, by using Lightroom’s tools to exploit your camera’s full dynamic range. I explain how in this latest video. Like many inventions, this technique was born out of laziness. I wanted to avoid the sometimes tedious process of blending exposures manually in Photoshop, with HDR software, or my favorite plugin, LR/Enfuse. I also try to keep my adjustments flexible by using Lightroom’s non-destructive workflow whenever possible. This technique only works with Raw images, and scenes where the contrast isn’t extreme, but I keep finding more and more situations where it does work. If you try it, let me know how you make out! As always, be sure to view this in high definition (720p) to see the tools and sliders clearly. White Balance for Landscape Photographs – Part 3: A Special Problem from Michael Frye on Vimeo. Here’s the third part of my video series on white balance, where I present solutions to a common problem in landscape photographs—finding the right white balance when mixing low-angle sunlight with blue sky. If you haven’t seen them already, here are links to Part 1 and Part 2. Hope you find this helpful; I look forward to hearing your comments! And if you like the video, please share the link. 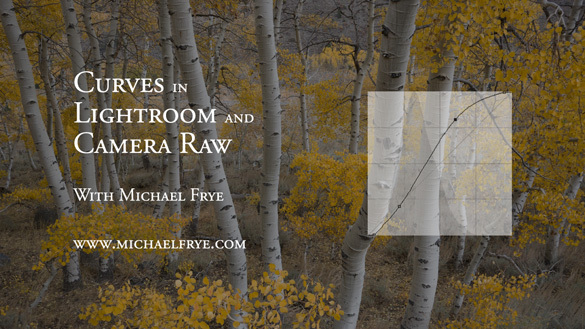 White Balance for Landscape Photographs – Part 2: Shade from Michael Frye on Vimeo. Here’s the second part of my video series on white balance. Today it’s all about shade—finding the perfect color temperature that brings out all the hues when there’s no sunlight in your photograph. If you haven’t seen it already, here’s a link to Part 1. Still to come is Part 3, where I’ll present solutions to a common problem in landscape photographs—finding the right white balance when mixing low-angle sunlight with blue sky. These videos are a great way to explain concepts like white balance, but if you want to put all the bits and pieces together and really master the digital darkroom, there’s still space available in my upcoming Photoshop and Digital Printing workshop, January 16-20. Hope you find this video helpful, and I look forward to hearing your comments! 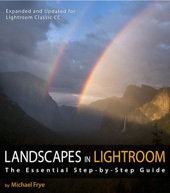 White Balance for Landscape Photographs – Part 1: Sunlight from Michael Frye on Vimeo. My recent critique of Mark Wilburn’s dogwood photograph prompted a lively discussion about white balance, so this seemed like a good topic for a more in-depth treatment. I’ve created three videos on white balance for landscape photographs, and here’s part one, which looks at images with sunlight, including sunrises and sunsets. 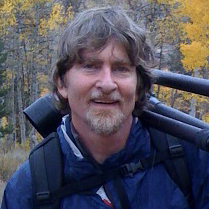 Part two will discuss photographs captured in the shade, and part three will present solutions to a common problem in landscape photographs—finding the right white balance when mixing low-angle sunlight with blue sky. In all of these videos I discuss what I think is the key to setting color temperature—finding a good balance between warm and cool colors, and preserving the vibrance of all the individual hues. To see this video clearly, be sure that “HD” is on (the letters “HD” should be white instead of gray; if not, click on them), and click the “expand” icon just to the right of “HD.” Once you’ve expanded you might want to turn Scaling off if you have a big monitor. As I mentioned yesterday, my new eBook will discuss my entire workflow in depth. I’ll post more details soon. Vision is the most important part of photography. Your eye is what makes the difference between a great photograph and a mediocre one. But when realizing your vision and making it come to life in the final image, getting the right color is vital. Recently I posted two videos about using curves in Photoshop, Lightroom, and Camera Raw. But there’s a more fundamental step that I haven’t talked about, something you might want to do with Raw files before adding curves, correcting white balance, or doing anything else: choosing a profile. What is a Camera Profile? 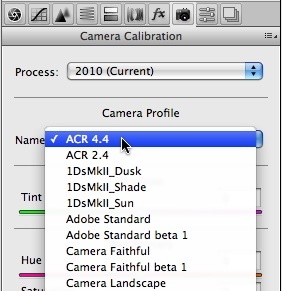 A camera profile is a translator: it’s translates the colors that a camera captures into the colors they should be. In other words, if a certain camera tends to turn reds into orange, the profile will correct for that and convert those reds back to their proper hue. Of course there’s no such thing as “correct” color—it’s all subjective. So profiles can come in different flavors: more saturated, less saturated, more contrasty, etc. Choosing the right flavor for your image is the first step toward making your visualization come to life. I’ve posted a new video on YouTube that delves into this seemingly esoteric yet actually quite simple subject. In it I show you how to choose different profiles in Lightroom, and explore whether creating a custom profile might be worthwhile. I evaluate some profiles I made with the X-Rite ColorChecker Passport, a $99 package for making custom camera profiles in any lighting situation. Yes, full disclosure, they actually gave this to me for free—I must be hitting the big time! Also, there’s one more reason for exploring different profile options: reducing noise, banding, and posterization. I show an example where the profile choice made a dramatic difference in noise and banding. 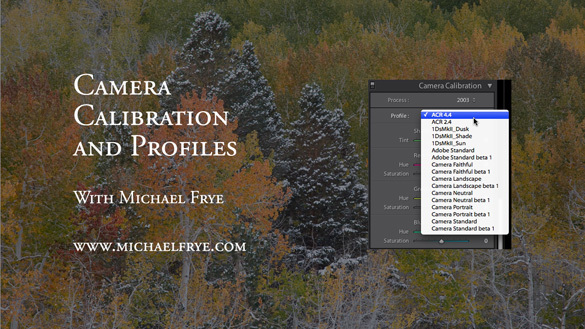 I didn’t have time to demonstrate it in the video, but the same profile choices are also available in Adobe Camera Raw—just look under the Camera Calibration tab, third from the right, as shown here. As always, it helps to view this at the highest resolution, 480p, and click on the double-sided arrow to make the video larger. I hope you enjoy it! Comments are always appreciated, and if you like video, please share it with a friend: Email this article, or click on one of the buttons below to post it on Facebook or Twitter. As promised, I’ve posted another tutorial on YouTube about Curves in Lightroom and Adobe Camera Raw. In this video I examine the default settings in these applications, and why you should avoid using them—at least sometimes. These defaults actually apply three curves to your image before you even start processing it. Watch the video to see what’s really going on “under the hood” with the settings in Lightroom and Camera Raw. I hope you enjoy these—comments are always welcome! To see everything clearly you need to view in high resolution—click on where it says 240p or 360p in the lower-right corner and choose 480p. Also, if you click on the little double-sided arrow you’ll see the video larger.